UPDATE: 7.00PM A severe thunderstorm has passed over the Dingo area and is heading towards Rockhampton region. The Bureau of Meteorology earlier issued a severe thunderstorm warning for areas including, Woorabinda, Duaringa, Carnarvon National Park and Dingo. The storms are likely to produce damaging winds, heavy rainfall that may lead to flash flooding and large hailstones in the warning area over the next several hours. UPDATE 3:05pm: THE Bureau of Meteorology has released a severe thunderstorm warning for the Central Highlands and Coalfields. Large hail, damaging winds and heavy rainfall are expected to affect the Carnarvon National Park and Mt Moffat National Park areas over the next several hours. The next update is due at 6:05pm. INITIAL STORY: A NUMBER of hail storms with damaging winds hit the Central Highlands area last night and thunderstorms are expected to continue around the region late this afternoon. Thunderstorms are most likely to hit Central Highlands and inland Capricornia areas today, but are expected to not be severe. North-east of Emerald, a number of left-over storms from a decent cell were on their way out this morning, after hail and damaging winds were reported around the Rolleston area late yesterday afternoon. Hail storm at Christmas Creek: Kerryn Piggott posted this video on Facebook yesterday of rain, wild winds and pea to marble size hail in 10 minutes at Christmas Creek 40km south of Rolleston. Bureau of Meteorology meteorologist Livio Regano said there were storms all morning north of Yeppoon. "In St Lawrence it was raining this morning as the last of the storms went over," he said. 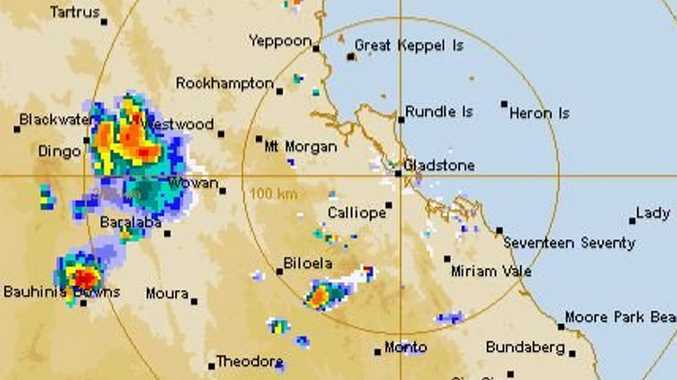 "In the late afternoon the Capricornia can expect more, but there's no warning of severe storms at this stage. "The hot spots are inland, inclusive of Rockhampton, but not on the coast. "Rockhampton up to inland of St Lawrence, inland down to Bundaberg and west out to Emerald have been flagged as most likely for storm development today." Hail and damaging winds near Rolleston: Karen Lennon posted this video on Facebook yesterday of hail, rain and damaging winds at Vesta, 22km from Rolleston on the Carnarvon Highway. In terms of rain fall, Mr Regano said there weren't high totals. "The highest 24 hour total was south of Springsure, which got 29mm," he said. "It was more wind and hail." For Rolleston, wind gusts climbed from 35km/h to 83km/h from 4pm to 4.34pm on Sunday. The town also received 9.6mm of rain within that time frame. Mr Regano said as the week goes on, the chance of storms in these areas will become less likely and conditions will become more stable. Hail storm near Rolleston: Karen Lennon posted this video on Facebook yesterday of hail, rain and damaging winds at Vesta, 22km from Rolleston on the Carnarvon Highway. However, with the weather drying up towards the end of the week, temperatures are expected to become warmer and more humid nearing the weekend. Central West towns including Longreach and Mt Isa, will peak to nearly 40 degrees for a whole week. These temperatures will be higher than the currently highest monthly average for Longreach, 37.4. "In spring there are normally big swings in temperatures, around the high 30s for these areas, but I'm not sure for the whole week,' Mr Regano said. "Anything can change but Longreach is looking at a long hot spell. "Far inland towns are looking at 39, and around Rockhampton it will be low to mid 30s. "Central Highlands and the Coalfields won't be as extreme and will be in the mid 30s." For the time being, Emerald and Moranbah will be around the mid 30s for this week, with temperatures climbing to 37 on Friday and 38 on Saturday. Karen Lennon: "Vesta", 22km from Rolleston, Carnarvon Highway. "Just got slammed with a ferocious hail, damaging wind wait for rain to stop to survey damage." Kristine Holmes: Balmoral, Capella. "A most welcome 12mm last night in a wild storm. A beautiful follow up to 30mm the week before. Very grateful." Evan Smith: Comet, Central Queensland. 4mm. Alan Thomas: Loch St, Emerald. "15mm of rain last night. Just what i needed." 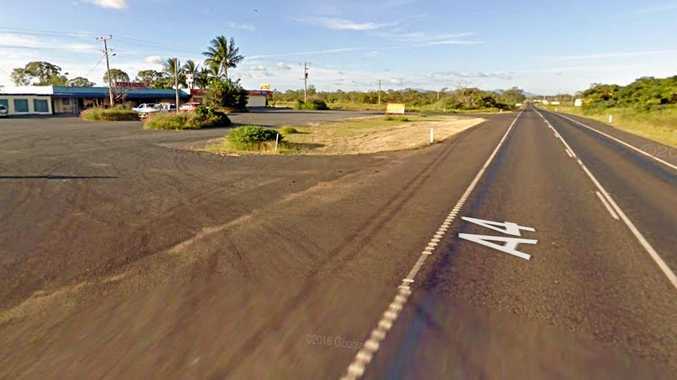 Fly Martin: Wongadoo, Baralaba. 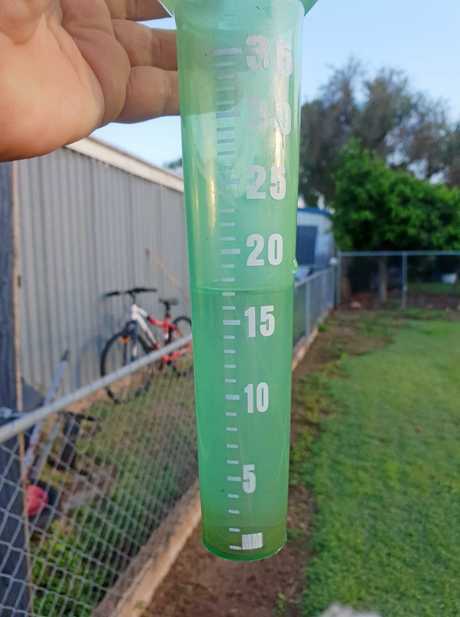 "11mm this morning." 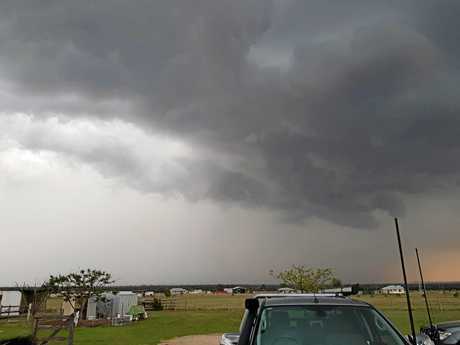 Jen Mitchell: NE of Emerald. 10mm. Kerryn Piggott: Christmas Creek, 40km south of Rolleston. "27mm of horizontal rain, wild wind and pea to marble size hail in 10 minutes at Christmas Creek. It is moving very quickly to the north towards Rolleston."